What you're looking at is a 3D visualization of a fly's thorax in action. The 3D animation, which was put together using data pulled from a particle accelerator, offers a glimpse into the inner workings of one of nature's most complex mechanisms. So why a particle accelerator? 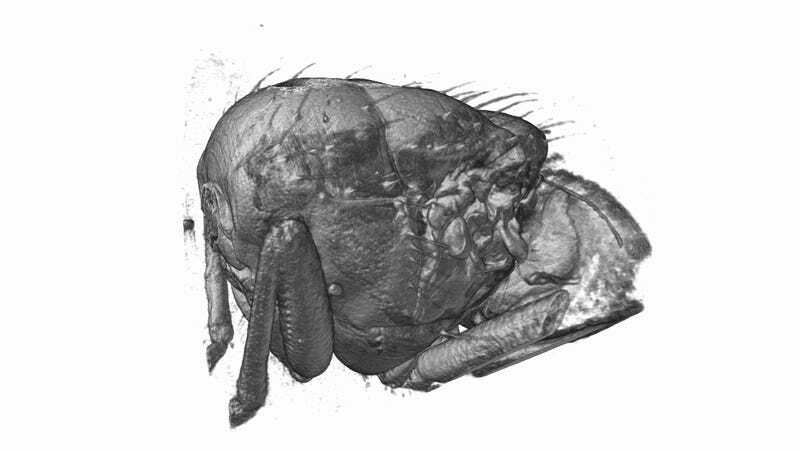 It allowed researchers from the Imperial College London, University of Oxford, and the Paul Scherrer Institute to record high-speed X-ray images of the blowflies in flight. These images were then used to reconstruct high-resolution three-dimensional tomograms of their flight motor at ten different stages of the wingbeat. The resulting visualization shows the various muscles and hinges required to power flight. In the video, the power muscles can be seen in yellow and red, and the tiny steering muscles are shown in green and blue. Interestingly, the steering muscles represent less than 3% of the fly's total flight muscle mass. Accordingly, the researchers were keen to understand how these parts were capable of controlling the output of the much larger power muscles. The answer has to do with deformations of the muscles and thorax. By shifting the flight motor between different modes of oscillation, the fly is able to divert mechanical energy into a steering muscle that's specialized to absorb this energy. Insights like these will eventually allow engineers to develop life-like miniature robotics. The study now appears in the PLoS One: "In Vivo Time-Resolved Microtomography Reveals the Mechanics of the Blowfly Flight Motor."